Mike over at Vox Political put up a couple of pics today from the Brexit campaign, all urging us to leave the EU. They showed the hypocrisy of the ‘Out’ campaign, which had accused their opponents, those who want us to stay, of scaremongering. See Mike’s piece at http://voxpoliticalonline.com/2016/03/05/the-posters-that-show-how-hypocritical-the-leave-campaign-is/. One of these pictures of a meme about the government supposedly giving all 75 million Turks the right to use the NHS. This follows the standard line that all the immigrants from the Islamic and Developing Worlds are all coming over here to scrounge from European, and particularly the British, welfare states. 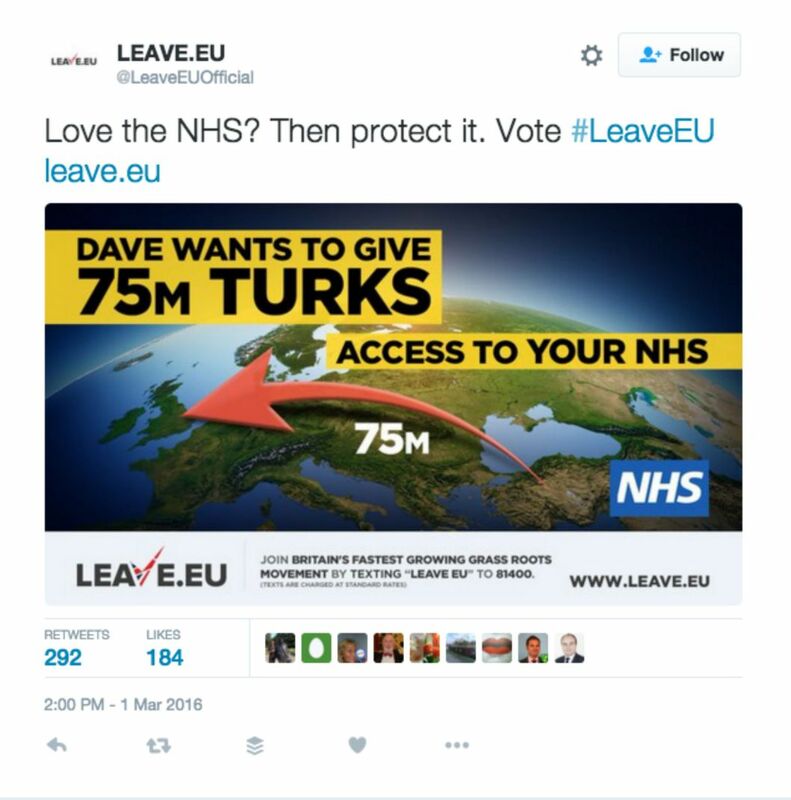 The ‘Out Campaign trying to scare us with the threat of all of Turkey coming to Britain because of the NHS. They aren’t. They came here to work, and were invited in to supply the labour shortage after the Second World War. Many migrants are acutely aware of this, and consider it hypocritical that Europeans now want to stop immigration. This comes across very strongly in David McMurray’s piece ‘Haddou: A Moroccan Migrant Worker’ in Struggle and Survival in the Modern Middle East, edited by Edmund Burke III (London: I.B. Tauris & Co. Ltd. 1993). The books a study of the history of the modern Middle East through the biographies of a few of its people, studied by historians and sociologists. Haddou was a Moroccan migrant worker, who came to work first in France, in Paris, before settling down in Dusseldorf, Germany. “Why don’t you just go home?” Haddou thought to himself on many occasions. This is what the racists wanted, too. Haddou’s answer was always the same: “To do what?” Most Moroccan men’s answer to this would be to set up a shop and sell something. But Haddou felt himself to be unsuited to the life of a small merchant. They were not involved in productive activity anyway, just buying and selling what others had made. In any case, he needed contacts to make a good profit. Otherwise no one would buy from him, and the Moroccan bureaucracy would slowly bleed him to death without a patron to protect him. Even if he wanted to make some kind of productive investment, the banks were not safe, laws were not enforced, and, besides, in what kind of manufacturing could he invest in Morocco that could possibly compete with foreign manufactures? the government favoured imported goods by keeping import tariffs low. What was worse, the Moroccan consumer was convinced that quality came only from abroad. The only domestic products worth buying consisted mainly of foods and traditional clothing. If he chose to produce them, who would buy his modern shoes, for example, when they could purchase imported Italian shoes? Or who would buy his Moroccan-made shampoo when they could buy it from France or Spain? Even dinner plates imported from Taiwan were preferable to those produced locally. The Moroccan government made matters worse by throwing their support behind commercial activities producing for export. In the region of Nador that meant growing citrus fruit for Europe. But citrus grew locally only on irrigated land, and most of the good, irrigated land had been bought up long ago by wealthy men with contacts. They had been told of the planned irrigation system before everyone else and had bought the land at a cheaper price in order to take advantage of the development. Today that land was too expensive to buy. Equally vexing was the fact that many of the prices for crops grown on unirrigated land were controlled by middlemen and the government in such a restrictive manner that they barely repaid the farmer’s investments – and then only during good years. No subsidies existed to carry the farmers during the bad years, which in recent times had far outnumbered the good. Given these conditions back home, Haddou never could understand why so many Europeans expected the migrants just to pick up and leave. They acted as if the migrants had come uninvited. On the contrary, he and the millions of other migrants from around the world were in Europe because the European governments, factories, and shop owners originally asked them to come work. The first time Haddou went back on vacation during the early 1960s, his boss gave him hundreds of work contracts to hand out to people in the Moroccan countryside who might want to join him in Europe, so eager was the boss to expand his migrant labour force. No, migrants did not originally knock down the door; it was opened for them. Unlike the better organised and more demanding European workers, migrants could be made to work harder and longer or to do dirtier and more dangerous jobs, thus producing greater profits for their European employers. As Haddou saw it, the real dilemma was that the Moroccans were dependent on Europe no matter what they did. They could stay home and – if they were lucky enough to find a job at all – produce goods for export to Europe, work on assembling and distributing products legally imported from Europe, illegally smuggle products in from Europe, or like himself, they could just pick up and go to work right in Europe. Directly, or indirectly, in Morocco or abroad, they were all working for the Europeans. (pp. 390-2). Basically Haddou came to Europe partly because of the hostile business environment in Morocco, in which the small entrepreneur is effectively shut out due to the endemic corruption. He also came simply because work was available, and the European business owners and managers were eager to find a cheap labour source to exploit. Whereas the extreme anti-immigrants see themselves as having come to Europe uninvited, Haddou, and probably millions of migrants and former migrants like him, are very aware that this is not the case. There is no mention in the chapter of immigrants coming to Europe because of our system of welfare benefits, or to exploit the NHS. Which in any case, has been answered already in the piece I put up by Nye Bevan, in which he states that the numbers of migrants using the British Health Service would be small, and it would be morally incumbent on us to give the same welfare benefits to foreigners who were over here, working. There are legitimate problems and concerns with mass migration, but allegations that they’re just here to steal or sponge off our benefits shouldn’t be one of them.